What a wonderful drawing. I have never heard of a mangosteen. I like the cropped one too. They are an interesting colour. Are they edible? 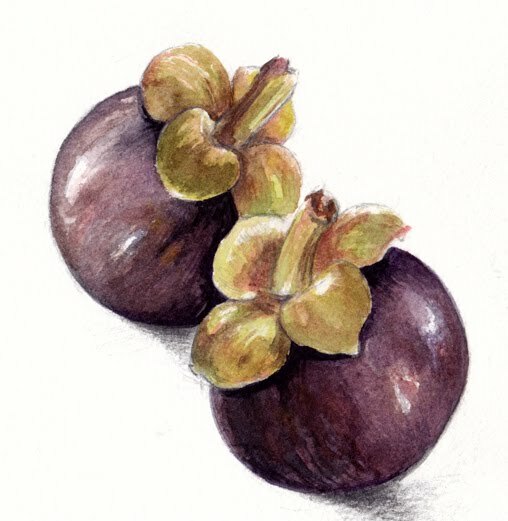 They are very nicely drawn, and I could almost smell them and feel the texture of the fruit in my teeth! Yummy! Thanks everyone. Yes they are edible and delicious...not sure how to describe the taste...someone on the web described them as creamy peachy with a hint of lychee. Alex, thank-you! Maybe you can help describe the taste? 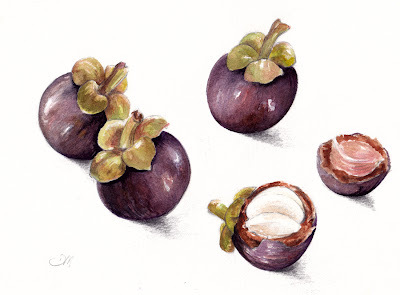 I've had mangosteen juice before, but I had no idea what the fruit looked like! Beautiful! !